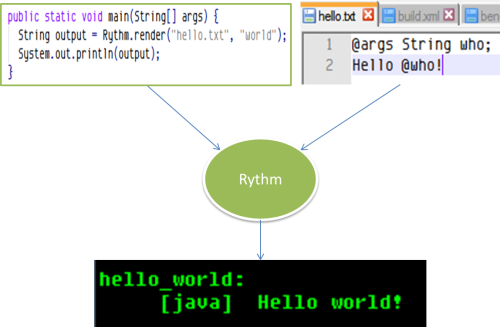 This document details how to use Rythm to write template source. Rythm Template Engine is a text generator that merges dynamic content into static template. In order to use Rythm to generate a text file, the essential work is to create template file which write down the static part and use Rythm syntax to define the dynamic parts. It is also important to understand that a template file has one or more arguments which is the origin of the dynamic content. The Java program pass parameters to template file via arguments to generate different result. So a template file is a text file, some parts of which have placeholders for dynamically generated content. The template’s dynamic elements are written using the Java language. Dynamic elements are resolved during template execution. The rendered result is then sent as part of the HTTP response. The magic @ character is used to lead all rythm element. If you want to output a literal @ character, you need to double it. E.g. All static content (those text not defined in Rythm elements including script blocks) are output literally including whitespace and new lines. multiple lines comment are put inside @* and *@ block. this is a multiple line comment. You are not required to declare template arguments at top of the template source code. It's more like a c++ style, you just need to declare arguments before they are used. Note that using dynamic expression evaluation might suffer the template performance a little bit. But obviously this is not a goo way to go for most times. @args String foo = "hello world"
The capability of invoking other template from the current template is an important feature that facilitate template reuse and makes template user's life easier. Many template engine provides tools to support template reuse, e.g. the #include and #parse of velocity, the #include, #macro and #import of freemarker, like those template engines, Rythm also provides tools to support template reuse, just in a more general and much easier way. Hi @whoCallMe, this is inside bar. Normally you don't need to add template extension (e.g. .html) when you invoke another template if the template been invoked has the same extension as the current template. For example, if you invoken template bar.html from template foo.html, simply use @bar() is enough. Usually when a template is invoked, the rendering result is inserted at where the invocation is happening. Rythm makes it flexible to allow user to further processing the result before inserted. The above code makes sure all expressions output within @foo() call will be escaped using “csv” format, while @foo().escape(“csv”) ensure the tag invocation result itself get escaped. The above statement invoke template bar using parameter [“foo”, true] and cache the result for one hour. Within the next one hour, the template will not be invoked, instead the cached result will be returned if the parameter passed in are still [“foo”, true]. So you see Rythm is smart enough to cache template invocation against tag name and the parameter passed in. If the template invocation has a body, the body will also be taken into consideration when calculating the cache key. The above statement shows how to pass additional parameter to cache decoration. Although template invocation is already very simple and easy to use compare to other competitors, Rythm provides an even more lightweight way for code reuse: the inline tag. Suppose you have some repeated code structure in one template source, and you don't think it's heavy enough to isolate them out and put them into a separate template file, then inline tag is your friend. Seriously I found this feature is one of my favourite feature in my daily works. The code demonstrate how you define a inline tag “book” and use it immediately after definition. When I create html templates, I found the way is really a finger type saving feature. The above statement will put the content of template foo.bar in place. “foo.bar” is translate into file name following template invocation convention. The difference between @include(“foo.bar”) a tag and call the template via @foo.bar() is the former put the content of the template into the current template inline, while the latter invoke the template specified and insert the result in place. It is some how like #include vs. function call in c language. @include is super fast to reuse part of template because it suppress the function invocation at runtime. It’s a inline function call if you speak c++. In other words, @include process happen at template parsing time, while tag invocation happen at template executing time. @invoke("page." + spec) @// THIS WORKS! It is also not possible to apply invocation decorations to @include() for the same reason. Macro will be expanded at parsing time, therefore it is very fast at runtime but will generate larger class byte codes, furthermore macro will guaranteed to be executed when invoked with @exec, this is unlike @assign, which is executed for only once when assignment happen. Template inheritance is a good way to implement template layout management. Rythm use the same approach to look up extended template and template being invoked, for example, if you want to extend rythm/layout/foo/bar.html, you can declare the extend statement as @extends(layout.foo.bar). Please refer to Handling paths for more detail. Like Razor, Rythm provides a section concept to enable you to define sections in sub templates and output them in parent template. @args String title = "ABC Corporate"
In the above example people with sharp eyes can notice that the footer section render in the layout template is different from the sidebar section in that we supplied a default content to the former. So if user did not define the footer section in the sub template, the default content will be output instead.